© 2013 by Ronald Diel. All rights reserved. 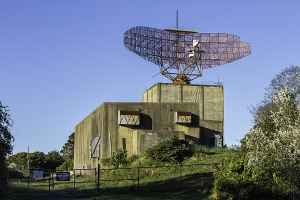 The AN/FPS-35 was a high-powered air defence radar buildt by Sperry Corporation. This long-range search radar was designed to operate at 420 to 450 MHz using frequency diversity. It was first deployed in December 1960, but problems hampered the program. Four of these units were operational in 1962. Eventually twelve (12) AN/FPS-35 radars would become operational in the US. The system suffered frequent bearing problems as the antenna weighed seventy tons. The radar feeds target information into high speed computers which work involved calculations for intercepting and destroying the target by missile weapons systems. It features many advanced anti-jamming provisions, redundant electronics for realibility, and simplified human control links. Concrete towers, 85 feet high and 60 feet wide, house the radar equipment. The antenna weights more than 70 tons and is almost as wide as a football field. The antenna drive mechanism, mounted on the roof, includes six, 100-hp motors and necessary reduction gears. Equipment, such as that for heating and air conditioning, switching gear and power generator are located in the first floor of the tower. The second floor houses the console room, machine shop and maintenance and testing areas. Radar equipment is placed on the third and fourth floors. The transmission lines and its accessoires are located on the fifth floor.